Comments : Comments Off on What do you want to shelve in 2012? -Engaging in email or status update one-upmanship. –TweetDeck and its tendency to activate the latent ADD in me. When New Year’s Eve rolls around, I’ll take the list and either burn it in a fireplace or bonfire or bury it at the beach. Or, if you don’t have access to anything organic, just flush it down a toilet and say goodbye and good riddance to those things on the list. It always feels great once it’s gone from view and I highly recommend this exercise as a holiday tradition to start this year. And, on the flip side, it’s also fun to start a “What I Want To Attract” (or what I’m calling my “What Would Be Heaven in 2011”) list for the New Year, but be sure to keep that one somewhere handy or visible. I either hang it on the refrigerator or keep it as a note in my wallet or on my desktop so it’s always somewhere to remind me of what I want more of in the new year. Okay, so that was not exactly what the sticker said on the outside of the handwritten note (not a thank you, btw) we received from what I’ll just call a “grey collar” worker we have in our lives right now, but it might as well have. 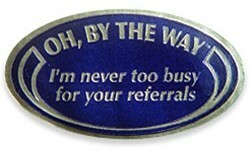 What it actually said was, “Oh, by the way, I’m never too busy for your referrals.” And, yes, it was on a black and gold very old-school-looking sticker almost exactly like the one below and it was stuck on the back of the envelope. My first question is simply where does one get the chutzpah?! The reality is this person has done absolutely nothing yet to prove that he’s good at his profession, let alone deserving of some of our social capital in the form of a referral to a close friend or valued business contact. Have you ever been on the receiving end of such a thing? But wait, it gets better. At the bottom of this person’s emails you can also find the phrase, “Business is good, but I’m never too busy to serve a referral from you.” Everyone that receives an email from this guy sees that? Where are they teaching this stuff?! I’m afraid to think about how many other people in his industry see that and then cut and paste that sentence to add it to their own email signature. Shame on all of them. AFTER I’ve delivered or completed a job well done or did a temperature check with a client to which they responded positively, I ask if they personally know of anyone else that might benefit from what I’m doing or have done for them. Then, if you know the contact, or even you if you don’t, ask your client if he’d mind if you followed up with Barb and mentioned that he shared that he gave you a glowing review. I’ve never received an objection to that request, and, btw, if I’ve landed business because of a client’s good word of mouth on my behalf, there’s usually a handwritten thank you note along with a nice gift card sent priority mail to them stat. Bottom line: I believe it is never appropriate to ask a client for referrals until you’ve proven your value to them, and you’ve confirmed that they’re happy. If you’ve had any examples of this not being the case, please share them with us because if someone is advocating this as a tactic, I want some real proof that it is effective. Although, I guess it is possible that this guy has just gone rogue, but I doubt it because it wasn’t too hard to find that lame sticker online. Sigh. Are you flexing your digital muscle? Bella Domain clients typically fit one of two profiles. The first are early-stage execs that are in need of an extra set of skilled biz dev or marketing hands to dig-in and explore new opportunities, programs, channels or partners. These folks typically know how to flex their digital muscle already and mainly need help with strategy and/or execution. The second are solopreneurs focused on maintaining the delicate balance of actually delivering services to their clients (usually word-of-mouth referrals), and doing their best to try to market and promote their business so that they’re continually filling their pipeline with prospective new clients. In most cases, the latter is easier said than done. For the solopreneurs, I found a helpful USA Today article on using today’s tools to take your biz to another level by finding some “workout partners” (like me!) to help you flex your digital muscle. And, if you’re in the solopreneurs category, and also happen to have a Web 1.0 site, in what is a Web 2.0 world, well on its way to being a Web 3.0 world, definitely feel free to contact me. In most cases, I can provide the social networking and/or website help you probably need. Comments : Comments Off on Are you flexing your digital muscle?